Belmont University Doctorate of Physical Therapy students played an important role in honoring a fellow 2003 Belmont DPT alumna, Sara Pigg Walker, on September 25. Belmont’s current DPT students organized a Kids for Kids Fun Run, a new event added to the annual Sara Walker Run 5K, where kids were encouraged to run for children around the globe. Belmont’s DPT students teamed up with the Sara Walker Foundation and Lipscomb University to help organize this event in honor of Sara Walker, by spreading her message of hope through Jesus Christ. The first Sara Walker Run occurred in April 2011, when Sara’s Belmont PT family wanted to raise funds for Sara’s medical expenses after she was diagnosed with cancer. Her 2003 classmates, with the help of the Belmont School of Physical Therapy faculty and STAR Physical Therapy, successfully organized this family-friendly 5K race for hundreds of Sara’s friends, family and blog readers to offer support and encouragement. Due to its success, and in an effort to continue to honor Sara, the annual Sara Walker Run continues today and serves as the Sara Walker Foundation’s main fundraising event. Sara’s story begins when her life changed drastically in December 2010. She was happily married to her husband Brian, had two healthy boys, Camden (age 5) and Scott (age 3), and was expecting their third child to be delivered only days before Christmas. On December 6, their wedding anniversary, Sara gave birth to her still-born daughter, Anna Elizabeth. Just four weeks later, multiple suspicious lesions were found on Sara’s liver, and in January 2011, on her 33rd birthday, Sara was diagnosed with stage 4 colon cancer. After 16 rounds of chemotherapy and three clinical research trials, Sara’s earthly struggle with cancer ended in August 2012, at the age of 34. During her life, Sara had two great loves–writing and bringing souls to Jesus Christ. From January 2011 until she passed away, she utilized her love of writing to provide encouragement, always pointing her readers to Jesus. She candidly wrote of her physical, emotional and spiritual battles, hoping and praying she could provide encouragement to at least one reader. God took her story and writings and reached over 700,000 readers worldwide! What resonated most with her audience was the concept of “savoring.” She expressed frequently the value of enjoying the little things life has to offer and seeing each moment as a gift from God. Because of her great outreach to the lost and hurting, her family and close friends established The Sara Walker Foundation in 2012 to continue to provide hope to others in her honor. Because of Him, her story continues today. Sara’s sister Dinah Hall, also a Belmont DPT alumna (2006), with the help of Williams, LaRocca, Kell and Emberton, successfully added a Kids for Kids Fun Run this year for more than 200 kids. The Fun Run included multiple obstacles and events designed and organized by Belmont’s current DPT students. This student team was led by scholarship recipients Kell and Emberton. 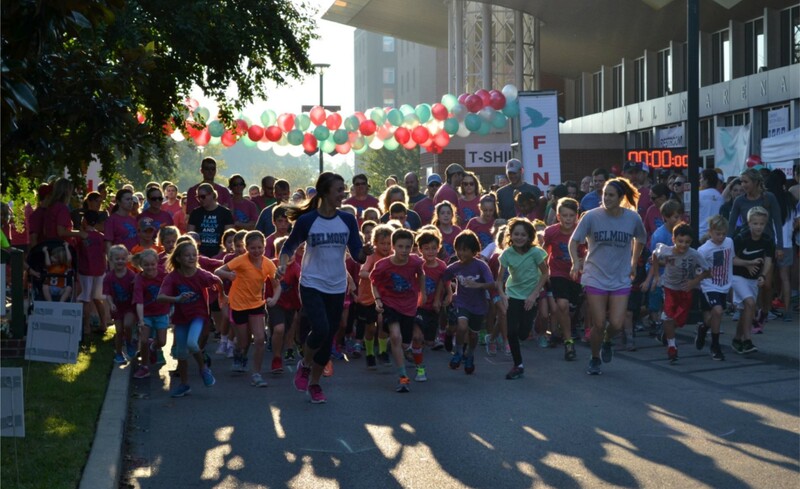 This year’s run included nearly 700 participants, and featured a new event—the Kids for Kids Fun Run and children’s worship service led by Sara’s Dad ‘Papa Pigg’. The event successfully raised $75,000 of which 100 percent will go toward missions supported by the Sara Walker Foundation. To learn more about Sara’s story, the mission of the Sara Walker Foundation and the lives she has touched and continues to inspire today, click here.